In late spring 2017 a quaint three bedroom two bath Airplane Bungalow goes up for sale on North Chester Ave. With over 1,400 square feet and a lot nearing 9,000 square feet, this property is the exact search criteria of many homebuyers. It had been tastefully renovated to include marble counters, French doors off the master and a modern pool. Zillow.com’s “Zestimates” lists the value at $1,123,779 a significant amount of money, but not a crazy number for Bungalow Heaven homes. After what I could only imagine, much debate, the owners and their Realtor list the house for $1,095,000. By under valuing it, they figure they will draw more traffic. Forty-six days later the sale closes at a final price of $1,075,000 Twenty thousand dollars under list price and almost $50,000 under Zillow said it was worth. What went wrong? Why did such an amazing property go for less than list. Generally, it is pricing strategy that does this. The overpriced Zestimate can inflate the value in the mind of the owner. The Realtor does their best to talk them into reality. In the end they meet in a middle that is actually off center and list at a price they feel will work. Unfortunately, the Zestimate can also scare away buyers that fear a bidding war as they undoubtedly look it up the themselves. Another approach could have been to price it just under the $1,000,000 mark. A renovated Airplane Bungalow is a great home that many potential buyers can see, however, it is an amazing prize to an architectural enthusiast that knows what an Airplane Bungalow is. A price under the seven-figure mark could have brought in more people therefore increasing the odds of finding a fan that is willing to bid more than list price. Finding multiple fans of architecture could have been done through some targeting marketing. Home values constantly change and online estimators like Zillow's Zestimates, called an Automated Valuation Model (or AVM) are most often inaccurate. 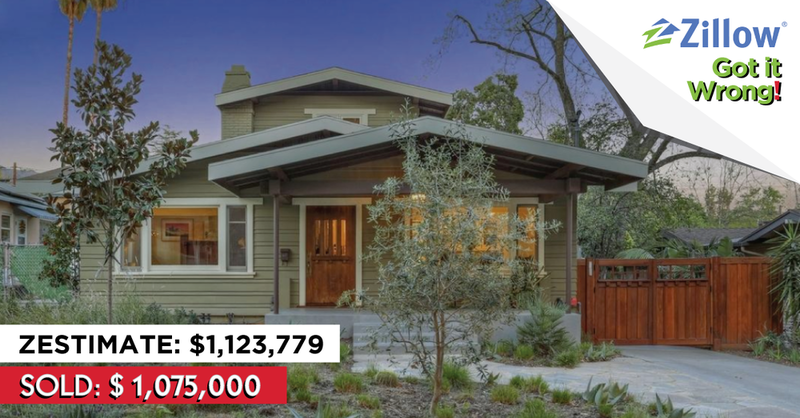 Recent sold data in Bungalow Heaven from the summer of 2017 showed Zestimates being as far off as $120,000 in under-valuation and $48,000 in over-evaluation as seen in the story above. This very issue of massively incorrect home values has stemmed a massive class-action lawsuit against Zillow and I can only imagine more disgruntled homeowners will be coming forward. There is often a major difference between property Zestimates and actual sold prices of homes and the reasons are pretty obvious once you know how house Zestimates are calculated. Zillow’s Zestimate is purely an estimated market value of a property and is to be considered just a “starting point” according to Zillow’s website. Zillow readily admits that the price or value accuracy is based on how much property data Zillow has. Their real estate data is from public records and they “do not know about home updates and remodels” and is generated by a computer algorithm. "It is 100% impossible for Zillow to know about your original hardwoods"
It is 100% impossible for Zillow to know about your original hardwoods or how much you have restored the wood trim in the living room from years and layers of white paint. Zillow Zestimates are more of a conversation started that anything else. Zillow itself recommends that if you want the real value of your house, you pay a professional appraiser to complete appraisal or contact a Realtor to generate a Comparative Market Analysis (or CMA) for your property. A CMA is a tool us agents use to get a true sense of what the market will pay for your property by looking at recent sold comparables. I can scrub out that total fixer home down the street that is pulling down values or the crazy over the top house that is jacking up prices, together we control what comps go into the CMA, and we can adjust the comps for items your home may or may not have in comparison. Items like renovations completed or a pool the neighbor has that you do not. While a basic CMA will give you a range, a custom CMA can give you more exact values. A CMA is a great tool for those preparing to sell, but it also good for any homeowner that is curious to know how much his home is worth in the current market. If you are curious to know how off Zillow is, I would be glad to generate a CMA on your Bungalow Heaven home. Just click the link below. It will generate an automated report, if you want a customized report with specifics to include the work you have to you home, fill out the form to the right and I will be in touch. Generating a CMA is quick and best of all…free and carries no obligation. Note: for mortgage refinancing and homeowner’s insurance, you will need to pay for an official appraisal. If you were to consider my services if you are considering selling your home I am sure you will be surprised at the level of service Podley offers and has offered for the past forty years in Pasadena. Michael Robleto is a REALTOR® with Pasadena based Podley Properties. His analytical and open approach to sales has served his clients well in his twenty years of sales. Michael brings a modern data and technology-driven approach to real estate while focusing on the historic architecture of Bungalow Heaven. Tapping his experience in media and journalism, he publishes in-depth blog articles that will be of interest to homeowners and home-buyers. He can be found on Facebook, YouTube, Twitter and Instagram under the common profile name of his blog BungalowAgent or at www.BunaglowAgent.com/blog. For Sellers or Buyers Agent representation he can be contacted directly. Need a FREE In Depth Custom Pricing Analysis for your property, simply fill out this form. This free report Includes narrow price ranges, estimated days it takes to sell your home, how your renovations affect your value and when the best month to sell is.